Another Mrs Gutteridge entered the world on Saturday. 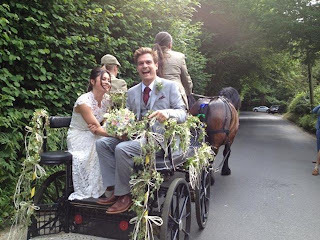 This time I wasn’t responsible – my eldest son, a film director, has finally tied the knot. The wedding took place at the home of an ex-Mrs Gutteridge, Jilly, my first wife and mother of the groom. It’s always nice to see the by-product of one of my divorce settlements: in this case, it's a picture-book beautiful farmhouse in Sussex, a perfect setting for any wedding. Understandably, my other exes weren’t invited, but Jo, the current Mrs Gutteridge, and Jilly got on like two houses on fire, and spent many hilarious moments sharing anecdotes about the debatable joys of life with me. From time to time I saw them hooting with mirth and looking over to where I sat surrounded by my 5 children and their friends, cousins, uncles and aunts. Meanwhile, at the head of the table, the dowager Mrs Gutteridge, now 92, sat in state as people we hadn’t seen for years came to pay homage. Everyone gradually got merrier through the evening – rather too merry, if truth were told, so I honestly can’t remember much of what happened other than I’m told that at midnight I was teaching Izzy how to breakdance. Apparently she was spinning on her back like a top and brought the house down. Or was the property just swaying in the breeze? Whatever actually happened on Saturday night, and I’m sure someone has the photographs, it was a joyous, happy occasion. I do like extended families, and ours just got a lot bigger with the addition of a whole new German branch. Ben has married a real stunner: beautiful, clever, employed and, best of all, the daughter of a German mother and an American army colonel. As I said in my post-wedding speech: what better combination could there be to produce a wife qualified to organise and possibly transform a boy who has inherited all of his father’s tardiness and ability to create chaos throughout his life. Natalie is an entertainment lawyer and supremely talented and ambitious, so in the not too distant future I look forward to seeing my Ben with a 12-movie deal from Universal, signed by its new Chief Operating Officer, Natalie Gutteridge. From the day Ben proposed to Natalie, his timekeeping has miraculously improved. Her father has instilled military precision into his family’s life; perhaps a little will rub off on these eccentric, chaotic Gutteridges. Mind you, she hasn’t yet cured my wonderfully creative son's inability to make decisions; eating in a restaurant with Ben is almost unbearable: he can never decide what to order. At the wedding, he clearly couldn’t choose which of his many male friends was his favourite, so he ended up with three best men. As a result, the best man’s speech was three times as funny and outrageous as usual. A recent survey found that it takes, on average, just six and a half months before a woman starts changing her new partner’s wardrobe. It could explain why Ben dresses so much more stylishly since he began going out with super-smart Natalie. It also explains what has happened to some of my own favourite shirts and jumpers over the years. Apparently, if subtle hints fail, women have two ways of transforming a husband’s dress sense: either throw objectionable items in the bin or accidentally place them in a very hot wash. It’s taken me ten years of living with Jo before I've caught on to the process, though I did give up trying to dress myself years ago: Jo took control on our very first shopping outing. I am the sort of man who, when he finds an item vaguely acceptable, purchases 20 of them to save himself the trouble of shopping again. As a result, Jo had quite a pile of outfits from previous lives to dispose of. At the party after the wedding I was complimenting Ben on his new shirt. At least it passes the Natalie test. For now.